One of the most important things you will buy when you have a new baby is a car seat. In fact, you won’t even be able to leave most hospitals without securing the new infant into a proper car seat. The choices in car seats are vast and varied, making the purchase quite difficult. Ultimately you need to get the best infant car seat for you and your child’s needs. Infant car seats are the best choice for new babies. Infant car seats are installed rear-facing and usually accommodate babies from four pounds through 25-35 pounds. While convertible car seats are also installed rear-facing, they are not as well suited to smaller babies. In addition, the infant car seats have a handle, so they can be used as a carrier as well. The carrier fits into a base which is installed in the car. This means that you can easily lift the carrier off of the base and out of the car to take the baby with you. 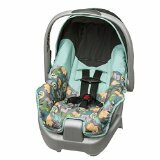 This is especially helpful when you do not want to wake a sleeping baby.There are some important features that you should look for when you go to purchase an infant car seat. For example, a five-point harness system is the safest for your baby. 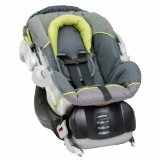 In addition, infant seats with side impact protection and compatibility with the LATCH system also bring important safety features. For comfort, extra padding in the seat is a plus. And, for convenience, you will want to look for an infant car seat that has easily adjustable straps and removable padding for ease of washing. 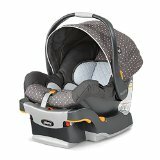 This Graco SnugRide infant car seat features a super easy, one-click system to attach it to its base or a Graco travel system stroller. It is the perfect rear-facing seat for babies from four to 35 pounds and 32 inches in height. For baby’s comfort, this infant seat features extra padding, a removable head support, and a foot/leg cover to keep baby snug. Moreover, the adjustable canopy keeps sun out of baby’s eyes. This car seat is ultra-lightweight, making it easy to carry from car to store to home and back. It has an excellent safety rating, meeting and exceeding all U.S. standards. It’ five point harness keeps baby in safely in place. It is also easy to install the stay-in-car base since it is LATCH equipped and has a special level guide to show you the proper angle of installation. This lower priced infant car seat is still very well rated by consumers. It is exceptionally safe, and it has most of the features of the higher priced models. For example, it has an ergonomic handle for ease of carrying, three shoulder and 2 crotch belt positions to accommodate your baby’s growth, and an easy-to-remove, machine-washable cover. And, the canopy keeps the sun and elements off of your baby. Most importantly, this Evenflo seat is a safe seat. It exceeds government standards for structural integrity and safety in crash tests. Furthermore, this infant car seat has an easy to install base that can stay in the car. The seat clicks into the base, so you do not have to re-install each time. Evenflo provides a safe infant car seat for a fair price, and even better, it is made in the U.S.A. 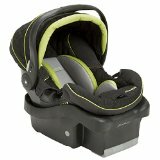 This Britax upper-end infant car seat is loaded with safety features. 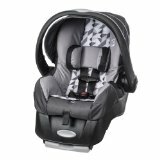 Britax is know to produce some of the best infant car seats on the market. It has Britax’s unique SafeCell integrated impact protection. It includes a deep shell with extra impact-absorbing foam to keep your baby safe. In addition, the base is also made to absorb the impact of any crash. Moreover, it has a five point harness, the LATCH system, and a stay-in-car base so that you only have to install it once. It is, in fact, an easy to install base, so you can be sure that it is properly placed. Of course, this Britax infant seat is also loaded with features that make it easy to use. It has an easily adjustable headrest with harness belts that do not need to be re-threaded to adjust. 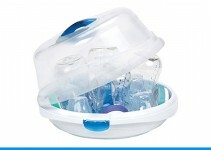 It is made with premium fabrics, and the cover is easy to remove for washing. The Evenflo Embrace infant car seat is recognized by safety advocates as a great car seat for low birth weight babies. It accommodates babies from four pounds to 35 pounds with easy, up-front harness adjustments and a removable head pillow. This seat is rated 25 percent lighter than most other infant seats so that carrying it will not be quite as much of a burden. It has an adjustable canopy to keep the sun and elements away from your baby. This rear-facing infant seat provides enough cushioning to help your baby stay comfortable while riding in the car. The car seat base is easy to install in your car with a central pendulum that assures that you place the base at the right include. The base stays in the car, so it only has to be installed once. You can purchase extra bases for additional vehicles if needed. Baby Trend’s exclusive Flex-Lock latch system allows for the car seat base to be installed once and the carrier to be easily moved in and out of the car. It has a standard four-button positioning for ease of use in any car. Additionally, the base has its own level adjustment indicator so that you are always sure that the base in properly installed. The seat itself has a five point harness with an easy adjustment lever right on the front, so the car seat grows with baby and lasts longer. It has an easy carry handle with a smooth finish, so it will not scratch up your arm when you carry baby from car to other locations. As for safety, it a number one rated infant seat for safety. It has energy absorbing foam to help in side impact crashes as well as a myriad of other safety features. The Eddie Bauer Surefit infant seat is designed to keep even the tiniest passengers safe when riding in the car. This infant seat can accommodate babies from four to 35 pounds in its comfortable, safe seat. 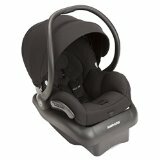 Specially padded to withstand side impact crashes, this seat keeps your baby comfortable as well. Comfort is key in this seat. 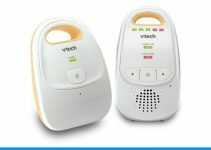 It has soft fabrics to keep your baby snug, and it includes a special infant insert to cushion even the smallest babies. The infant insert is removable so that as your baby grows, the seat will still be comfortable. Additionally, the five point harness is also easy to adjust on this model, so it can grow with your baby.The seat is relatively lightweight at only about 18 pounds, empty. Its ergonomic handle does make carrying easier. The sunshade canopy is a nice touch when it is bright out. Baby can be shaded from excess sunlight with a flip of the shade. Ease of installation is an important factor with the Chicco Keyfit Infant Car Seat. This stay-in-car base installs with the LATCH system and has a spring loaded leveling foot and an easy to read bubble leveling indicator, so you can be sure of proper installation and a safe baby. In addition, there is a five point harness and energy absorbing cushioning that keeps baby safe if there were to be a side impact collision. The Chicco Key Fit infant seat has a built in insert to keep babies from four to 11 pounds safe and secure. This insert is removable when the baby outgrows it. In addition, this seat also has an easy one-hand system for removing the carrier from the base. It has an audible click when the carrier is properly fitted into the base. This is a number one safety rated seat, so you will surely find that you can’t do much better if you are willing to spend the extra dollars for this stylish, safe seat. While the Evenflo Nurture Infant Seat may not have all the bells and whistles of the higher end infant seats, it is still a very safe seat. It has an adjustable fiver point harness to keep baby safe in place. The harness can be adjusted in three ways at the shoulder and two at the crotch position so that the seat will be the proper fit and grow with your baby. In addition, this seat has added foam cushioning for safety and comfort. This seat accommodates rear-racing infants from five to 22 pounds. It has a base that can stay installed in the car, but it can also be installed without the base when necessary. The ergonomic handle makes carrying the seat and your new baby an easy task It is easy to take this seat in and out of the base so you can bring it with the baby when you go into busy places. This Bob B-Safe Infant seat is highly rated by its many customers. A higher end model, it is made in the U.S.A., and provides SafeCell integrated safety protection. It has an impact stabilizing steel frame for strength where it is needed, and its base collapses to absorb impact in a crash. In addition, its deep shell provides a safe haven for your little one with extra energy absorbing foam for comfort and safety. The base to this seat is one of the easiest to install in the car using seatbelts of the LATCH system. It has a level indicator on both sides, so you know that you have done the install correctly. Additionally, this infant carrier has a five point harness and is easily adjustable to grow with your baby. It can accommodate babies from five to 35 pounds in the safe, rear-facing position. 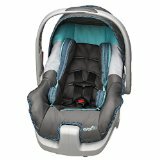 This Maxi-Cosi Infant Seat is another upper end model, and it can accommodate babies from five to 22 pounds. It is the lightest premium infant set available. This seat features the patented air protect system to keep baby safe in case of impact. It provides extra cushioning around the baby’s had, where it is needed the most. The stay-in-car base is easy to install, and the five point harness provides extra protection. The premium fabrics used on this infant seat will wick moisture away from your baby, keeping her dry and comfortable. In addition, the cover is easily removable for machine washing and drying. There is no need to re-thread harness straps to remove this cover.